Should you name a wild animal? Still, if you are Doug Peacock or Timothy Treadwell, and the animals involved are individualistic and, more importantly, capable of eating you, it would be understandable if you would name them. Honorable adversaries and all that. But what about small birds? This summer a Cordilleran flycatcher (Empidonax occidentalis) nested on a porch beam. 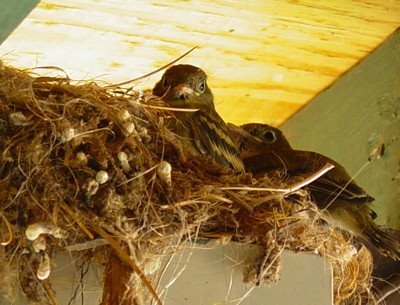 We had a nest there last year, and also once in the 1990s. M., who takes the position that wild animals are individuals, named her Lucinda, a name that sort of incorporated her “tseet” call and was also a bit of a tribute. Her mate became Sidney. She laid four eggs. As happened last year, the fourth egg hatched late, and that chick soon disappeared from view. This morning, after not having checked the nest for a couple of days, I saw only two fledglings, almost fully feathered and sitting outside the nest, but still being fed a healthful diet of moths by their parents. Did the oldest already depart, or did #3 die? I plan to check the nest for remains but not until it is empty. Last year and this, they have influenced our lives. We never turn on the porch light, and we shush the dogs when they bark directly underneath the nest. During the incubation, we peer out the living room window to see if the female is on her nest, and we worry when she is missing during a thunderstorm. We watched Sidney drive off a larger black-headed grosbeak who landed on the telephone wire too near the nest, while Lucinda beat up on a pine siskin likewise. Of course, we really cannot do anything for the flycatchers other than having provided them with a convenient nesting ledge. UPDATE, July 30: This morning when I checked the nest, the two fledglings were gone. Maybe #1 made an earlier departure after all. Unlike last year, there were no dessicated remains of #4 in the bottom of the next, so that hatchling's fate is a mystery. Damnit I've been missing your birds! I am still on this chapbook thing and am glad to see you are piling them up. :-) When everyone has their ten I'll string them together. Are you cool enough to buy our stuff? Feral girl raised by dogs?? Yellowstone NP and the "Trophic Cascade"